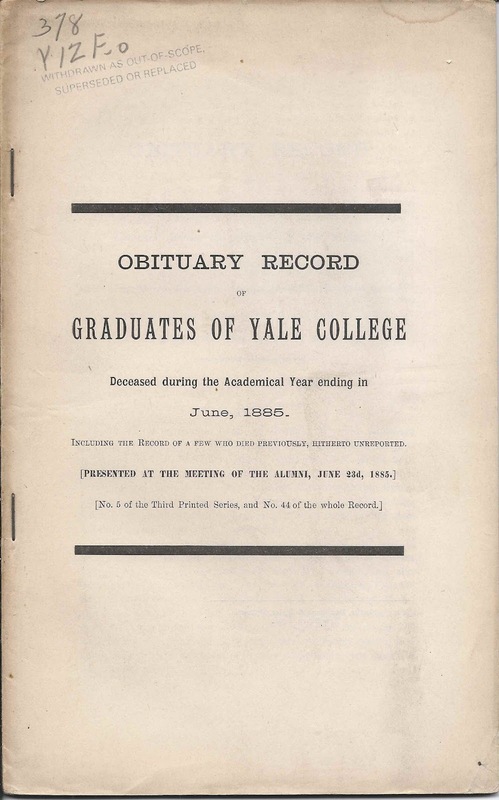 Obituary of John DeForest, Class of 1826, in the June 1885 issue of the Obituary Record of Graduates of Yale College. 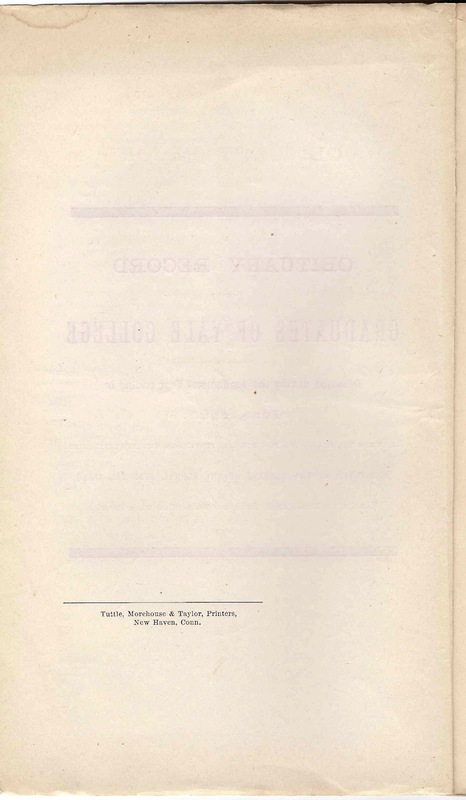 He was a physician at Watertown, Connecticut for the early part of his adult life, but suffered ill health in 1845 that forced him to give up his practice, and later extreme deafness that cut him off from society. His wife died in 1855 after a protracted illness. 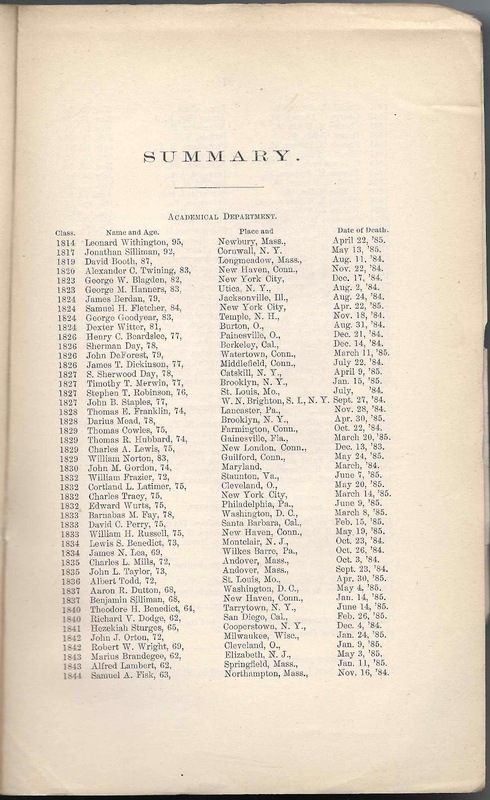 They had lost their first child, John Lyman DeForest, in infancy in 1832. And three years after Dr. DeForest's death in 1885, his surviving son, Erastus Lyman DeForest, died, unmarried. Such a grim obituary - I hope there were some rays of sunshine in their lives. Despite these challenges, Dr. DeForest was a philanthropist and a donor to the medical department at Yale. He endowed the DeForest Mathematics Prize at Yale upon the graduation of his son there with a degree in mathematics in 1854. John DeForest, the eldest child of Benjamin and Alma (Southmayd) DeForest, was born in Watertown, Conn., March 31, 1806. 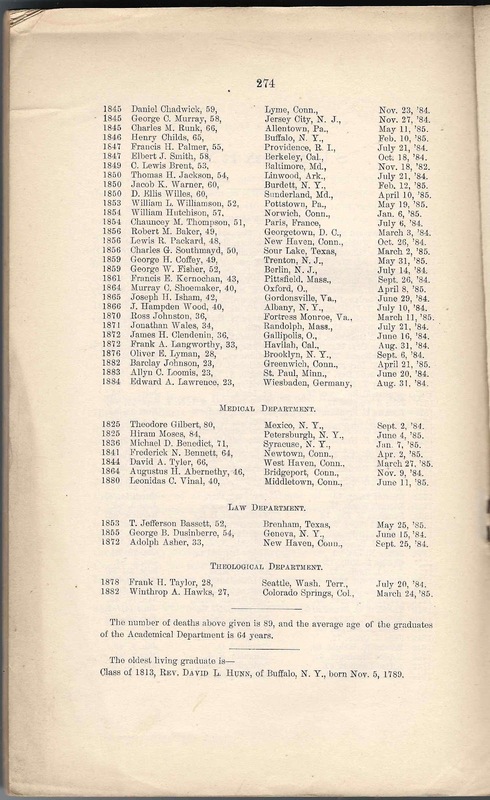 After graduating, he studied medicine with Dr. Samuel W. Gold, of Goshen, Conn., for three years, and meantime attended two courses of lectures in the Medical Institution of Yale College, where he received the degree of M.D. in 1829. He practiced his profession for about a year with Dr. Gold, and then availed himself of a favorable opening in his native town, where he continued in practice until 1845, when in consequence of ill health he was obliged to relinquish his profession. For the rest of his life he was not engaged in any active business, and for many years before his death he was cut off from society of his friends by extreme deafness. During his long residence in Watertown, he distributed his large wealth freely and wisely for the furtherance off objects of benevolence and public utility. He was the founder of the Senior Mathematical Prizes in this College, and a generous donor, especially to the medical department. He died of heart disease, in Watertown, March 11, 1885, at the age of 79. He married, May 16, 1831, Lucy S., eldest daughter of Erastus Lyman, of Goshen, who died August 3, 1855, after twenty-one years of protracted suffering. Their elder son died in infancy; the younger (Y.C. 1854) survives them. 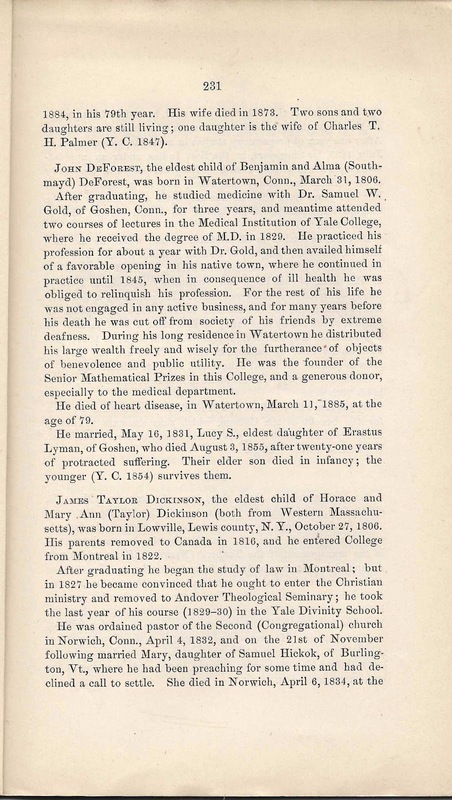 John DeForest was born 31 March 1806 at Watertown, Connecticut, or at Litchfield, Connecticut, the son of Benjamin DeForest III and Alma (Southmayd) DeForest. On 17 May 1831, Dr. John DeForest married Lucy Starr Lyman, daughter of Erastus and Abigail (Starr) Lyman. 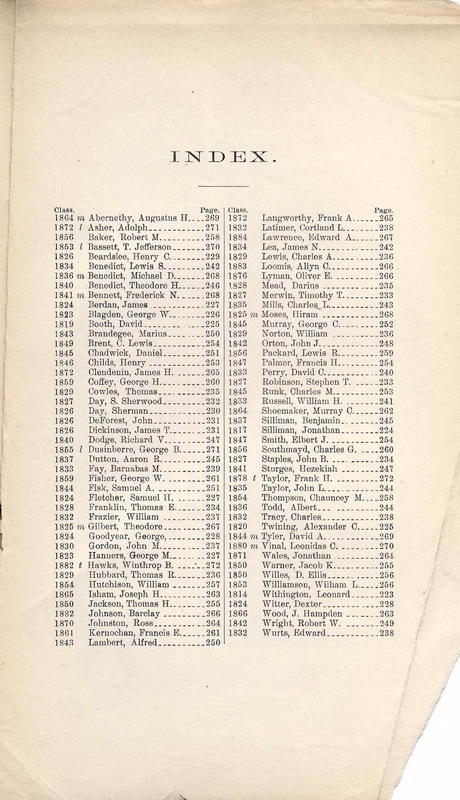 Their children, mentioned above, were John Lyman DeForest, who died in infancy in 1832, and Erastus Lyman DeForest, born 27 June 1834. Lucy Starr (Lyman) DeForest died in 1855, Dr. John DeForest in 1885, and Erastus in 1888.